Hardwood floors are beautiful, durable, and a sign of quality. To maintain their beauty and withstand the test of time, they need to be taken care of. Properly cared for wood flooring can last up to a hundred years or more. Taking good care of your wood floors is in your best interest, but what if they need repaired? How do you know whether you should restore or install new flooring? Get the process started by answering these questions. Does your wood floor need refinishing? The purpose of a finish is to keep liquids from damaging or staining your floors. A simple water test will help you determine whether it’s time to refinish. Pick a heavy traffic area and pour a tablespoon of water on the floor. An intact finish prevents the water from penetrating the wood. If the water soaks in, the floor needs to be refinished; how soon is determined by how quickly the water soaks in. How Do You Restore Wood Floors? Restoring wood floors isn’t a one-size-fits-all job. The depth and type of the damage to the floors, as well as the kind of durability you want from your newly refinished floors, will determine how your floors are restored. 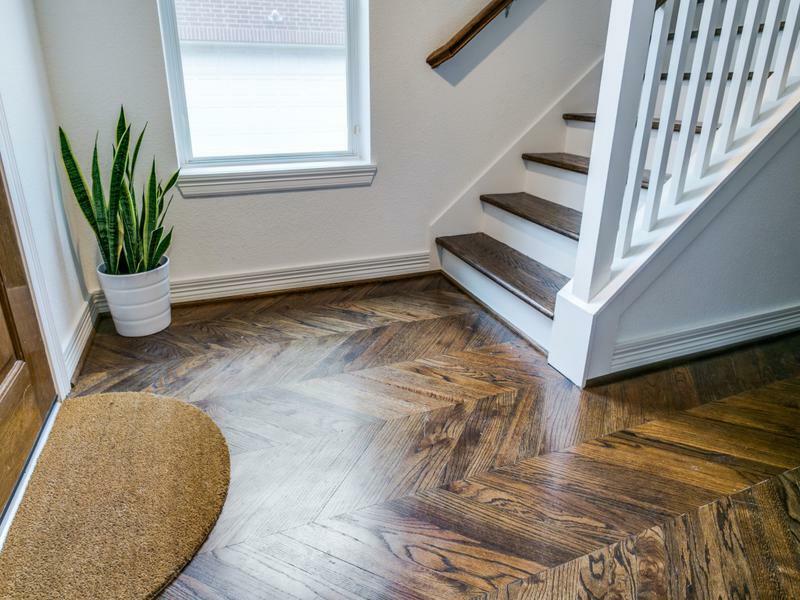 Screening vs. Refinishing: The amount of damage to your wood floors will determine if you can get by with screening or if you need full restoration. Screening involves buffing out and replacing the topcoat and is often sufficient for finishes that are just a little worn. Significant damage may require sanding the floors down to the bare wood and completely refinishing. Either way, care must to be taken to ensure you don’t sand down too far and cause additional damage. Filler vs. Replacing Planks: Filler can often cover minor damage but in some cases, planks need replaced. Either job can be tricky if you want the floor to match nicely afterward. Type of Finish: Several types of finishes are available. Water-based finishes are greener, but less durable. Polyurethane finishes are more popular for their durability, but they’re less eco-friendly. Is Wood Floor Installation a DIY Job? If your wood floors aren’t able to be salvaged, it may be time for brand new floors. It’s easy to get in over your head when you try installing new wood floors yourself, so do it right the first time and hire a professional. You need a combination of know-how and professional tools to do the job well. The right equipment: If you try to do a DIY floor installation, you will be facing a learning curve the entire time. You’ll have to buy all of the materials and equipment, watch youtube videos, and read enough forums to hopefully be prepared for the job. When you hire a professional, they have all of the equipment necessary to start the job and see it through. An experienced touch: Experience is needed to ensure that you’re able to foresee any problems and install everything the right way. With a DIY installation, you often find problems after the fact and either have to try fixing them yourself, or hire a professional. In the end you end up paying more than you would have if you hired a flooring specialist from the beginning. Safety gear: Restoring wood floors is a messy job, which is another great reason to hire someone who knows what they’re doing. They’ll use every kind of protection you can think of to keep the dust down and protect your belongings in other rooms. The usual gear includes plastic sheeting, facemasks, earplugs and safety glasses. Professionals also often have vacuums attached to the sanders to limit the dust that gets into the air. As you can see, restoring wood floors isn’t for the faint-hearted, and installing new floors is even more involved. Start with the right people at the beginning, and you’ll make sure you can enjoy your project sooner rather than later. Are you looking to improve or upgrade the flooring in your home? Get started with a free estimate.